In a location with magnificent views of the Atlantic, on the beach of Lalla Meryem, is the Four Seasons Casablanca hotel, Morocco, just 7km from the Hassan II Mosque, and very near the Anfaplace shopping centre. It is a luxurious hotel with five floors and 186 spacious rooms, including 29 suites; an ideal place for family holidays and business trips. Designed by the Foster + Partners studio, the avant-garde building is characterised by its freshness and elegance, in which PORCELANOSA Group has participated with the solid surface KRION®. Within the facilities of the hotel, we find KRION® in colour 9101 Crystal White+ in the restaurant area. We can distinguish three large pieces with imperceptible joins, a 16 metre long counter with an undulating appearance, and different curving radii, taking up part of the dining room, reaching the hallway. The 9.5 metre long, 4 metre wide c-shaped bar has a shelf on its closed side for the placement of ice and fresh seafood, and the sensational column that divides the rear part of the bar is also made with KRION®. 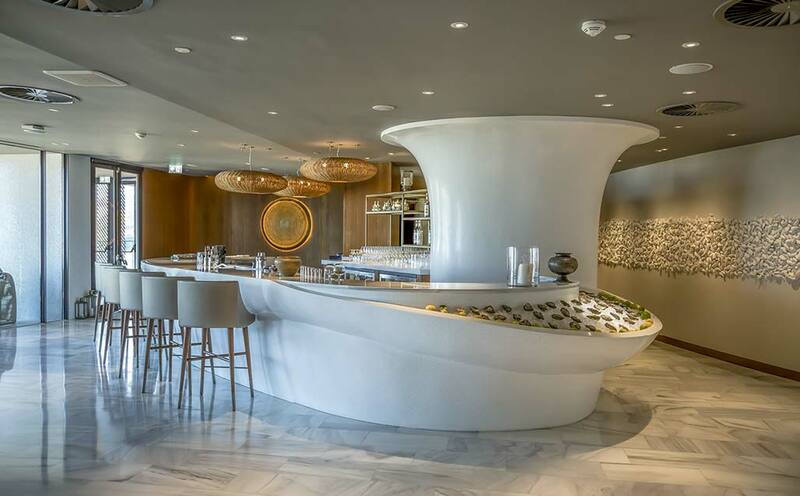 Finally, the oval shaped 10x7 metre spiral shaped bar gives the room a touch of the contemporary design which characterises the Four Seasons Casablanca hotel.